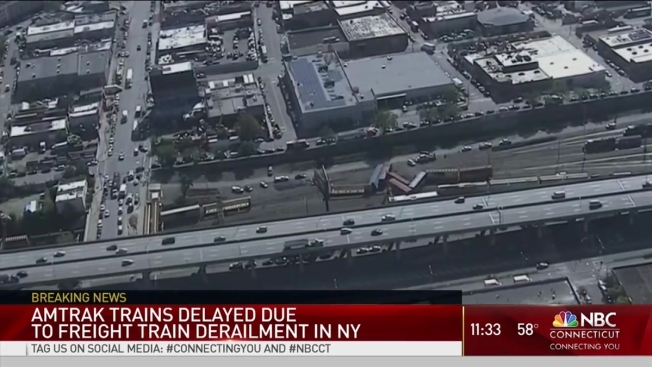 Several Amtrak trains bound for New York City were held in New Haven after a freight train derailment in New York, according to the Department of Transportation. Amtrak service has been partially restored, but the rail service warned of residual delays as of 12:30 p.m.
New York fire officials said several train cars came off the tracks at Longwood Avenue and Bruckner Boulevard in Hunts Point, Bronx, Wednesday morning. Company officials from railroad CSX confirmed the freight train belonged to them. Company officials said that eight cars derailed in the Oak Point rail yard in the Bronx. No injuries were reported and the cars were not carrying hazardous materials. The company said it was still assessing the situation and working on plans to right the derailed cars. DOT spokesman Kevin Nursick said he was alerted to the derailment and that Amtrak trains were being held in New Haven. Amtrak said Northeast Regional and Acela Express services were suspended between New York and New Rochelle and service has been partially restored. Travelers in the area should continue to expect delays. The company apologized for the inconvenience.